~ I received a free copy of this audiobook in exchange for an honest review. Geography was not the only difference between the two groups. If you lived in “The Blessed Lands,” you referred to your people as “The Blessed” while the others were called “The Soulless.” However, if you happened to live in “The Republic” you referred to the Blessed as “Zealots” and your own people as the voice of reason. Helena and Jason grew up learning to quash their “passions” and to use logic and reason when problem solving or when making decisions. Helena grew up in a privileged family. Her mother was scientific in every way, including child rearing. Her father was a beloved teacher at the Polytechnic Institute. Jason grew up with Helena, but his family was not as well off. Despite the difference in their social status, they were the best of friends throughout their childhood. Jason moved away to further his education and to achieve something with his life and Helena missed him terribly. Through a quirk of fate, (although their analytical brains would never have accepted fate as a valid hypothesis) Jason’s new job brought him back into Helena’s life at exactly the time she needed him most. Helena’s father had recently died and she had watched him slowly fade away. Since she idolized her father she had been devastated by his death. Compounding Helena’s heartache was her mother’s emotional and eventually even physical absence. Helena was contemplating her loss and what to do with her future when she sees Jason running nearby. They both notice something in the water and quickly realize that someone is drowning. Jason dives in to save the person who turns out to be a nine year old girl named Kaylani. What neither Jason nor Helena realized at the time was that Kaylani would change their lives forever. You would think that just the plot lines I have already mentioned would be enough for one book, but those things are just tiny parts of a much more epic tale. Throw in the supernatural, priests and priestesses, a government bent on jailing anyone and everyone who defies the law even in the smallest way. Add an artist commune for people with damaged souls, a retiring government official who is a stickler for the rules whether they are right or wrong and a zealot with delusions of grandeur. Once you add all these characters into the story, you have one heck of an interesting read or in my case, an interesting listen since I was lucky enough to listen to the audiobook version. THE DAUGHTER OF THE SEA AND THE SKY surprised me, but I am very glad that I chose to listen to it. I enjoyed this audiobook very much. The audiobook in its entirety was well done. The characters were well written and easily relatable. The setting was unique and interesting. I loved the division of the two countries. The author does an incredible job of detailing how different groups of people see themselves and each other. David Litwack seems to have an ingrained understanding of how different people view the world around them. It is always interesting to me how multiple people can view the same event and draw vastly different conclusions from it. David Litwack also does an excellent job of portraying the many character’s personal quirks and in explaining how each character’s life experiences and their personal history has contributed to their character and beliefs. 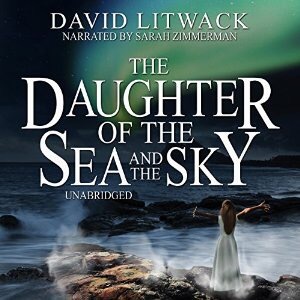 By the end of this audiobook the listener feels that he (or she) really knows each character and is able to understand what motivated them to act in the ways that they did.